PNW District Optimist Clubs: The Vikings are coming! Please click to enlarge and print. Every year, the Abbotsford Optimist Club hosts Family Fun Days, a free activity for all ages that includes food, refreshments and entertainment. This year, the club is pleased to announce that the Vikings are returning to "Abbot's Fjord" to reclaim the land they first set foot upon last year. 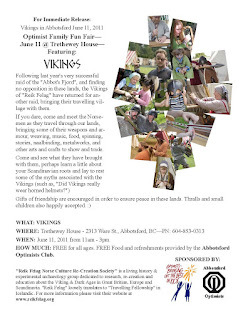 These fun-loving Norsemen will initiate a friendly raid at the Trethewey House, 2313 Ware Street, Abbotsford, June 11, 2011, 11:00 a.m. to 3:00 pm. As part of the Reik Felag (travelling fellowship), they will demonstrate weapons and armour, weaving, music, food, naalbinding, metalworks and other arts and crafts and spin stories of their travels, Norse myths, and Viking tales. Children and their parents will also enjoy treasure hunts, puzzle contests and a coloring contest. To learn more about the Vikings, please visit www.reikfelag.org. To see past Family Fun Day photos, please click here. In preparation for this year's festival, children ages 3-10 are invited to enter a coloring contest. Prizes will be given to top artists in categories 3-5 and 6-10. Click here to download the entry form and coloring page. Thanks to Gerry Morrison, Secretary, Optimist Club of Abbotsford, for the story.